The field of global development places a high value on education and credentials. While you can get started in an international development career without a graduate degree, you will eventually most likely need to obtain at least a master’s degree for most career paths to avoid a career plateau. However, pursuing an advanced degree is expensive, time consuming and one of the bigger decisions you will make in your career. Here are 8 things you should consider before diving back into the books. While it is tempting to go straight into a graduate program, having a master’s degree with no real work experience can sometimes do more harm than good. Entry-level positions in development, while competitive, often do not require a graduate degree. These positions are usually very administrative, so those who do have a graduate degree might hear they are overqualified for the job. However, if you don’t have any work experience, you won’t be qualified to advance. The result is those who go straight from undergrad to graduate school often find themselves stuck in a rough spot of being overqualified for entry-level positions but underqualified for mid-level positions. If you can combine your graduate degree with a few years of relevant work experience, you may find the employment environment much friendlier when graduation comes. Not to mention that getting a few years of real life experience can help you hone in on what it is you really want to pursue. There are many general degrees out there that can be applicable for a global development career: a master’s in international affairs, public affairs or even international development are just a few of them. While these can serve you in a global development career, hiring managers say they are increasingly seeking people with more technical degrees. For example, agriculture sciences, statistics, and engineering are all degrees in demand in the global development marketplace. For some jobs, having a master’s is literally just checking a box, and any field of study will do provided you have the right work experience. But by pursuing a more specific area of expertise, you will make yourself marketable to the jobs that require a technical degree as well as those that are looking for any kind of graduate level education. You may have found a great program you are excited about that will give you the training you need to pursue the career of your dreams. But before you invest money and time, make sure there will actually be opportunities on the other side. Ask the school for statistics on job placement and look to see where recent graduates were placed. Talk to seasoned professionals with the same degree and ask them what prospects they see for recent graduates. Scan the job boards and see what vacancies are — or aren’t — out there. I talk to people all the time who are drowning in debt from their new degrees and yet they still can’t find jobs. 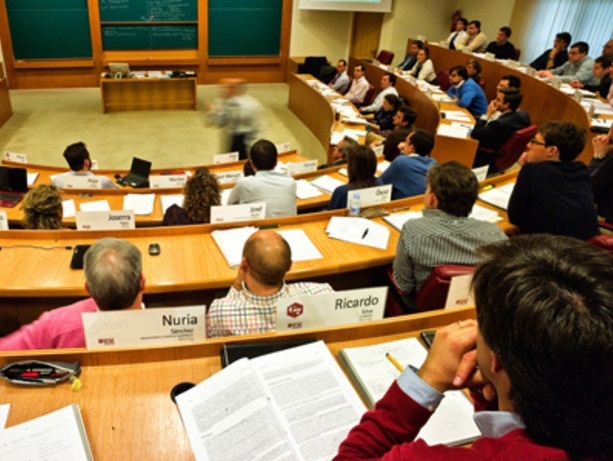 Going to an Ivy League school may help you land a top job in the banking or legal fields. But in global development, experience trumps school name for most employers. So instead of choosing the most prestigious school, look at which programs will provide you the practical experience necessary to be competitive in the job market. For example, some programs allow you to do field work as part of your degree or facilitate internships with major development organizations. Also look at the location of the program. If the program is based in a city where a lot of development activity happens – like Brussels, London or Washington, D.C. – there will likely be more opportunities for networking at seminars, conferences and events as well as internship opportunities throughout the year. Given the global nature of international development work, pursuing an online degree makes sense logistically and makes graduate education more accessible to people based outside of some of the education centers. However, most employers I talk to are still very skeptical of online degrees and do not give them as much weight as those obtained from a brick and mortar institution. Before pursuing an online degree, make sure you do due diligence on the program, its reputation and success rates. It’s probably worth talking to a few recruiters from organizations you hope to work at to see how they would view a degree from the online university you are considering. While massive open online courses can be a great way to gain additional skills from world-class professors, they are unlikely to help advance your global development career at this point without earning a degree at the end. If possible, try to work on a graduate degree part-time while working. Sometimes employers will provide education benefits that may help defray the cost. Additionally, you won’t be taking yourself out of the workforce, making it so much easier to get a job when you graduate. Working and studying at the same time can also help you apply both experiences on the other. You will come to class with real world challenges, questions and ideas and be able to go back and apply what you learn directly on the job. You will also be able to earn an income, often making a degree more economically feasible. You do not need to pursue a doctorate level degree for most career paths. However, if you want to be an expert in one of the social sciences – maybe an economist with the World Bank, a senior-level M&E expert or a top policy head at a think tank – you may need to pursue a Ph.D. However, this can typically be done mid-career and with a lot of forethought. Unless you have a very specific area you want to work in, like engineering or law, it’s often not worth it to pursue additional degrees once you have a graduate degree. For example, if you have a master’s in psychology, going back to school to get a master’s in international development is not likely going to help you much. Your time and money would be better spent gaining actual experience over collecting additional degrees.